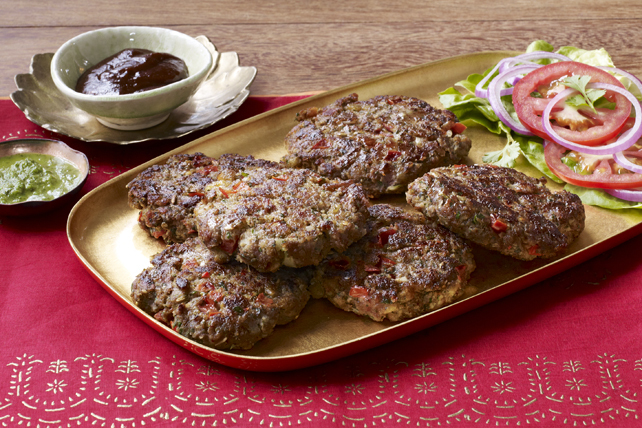 Named after the heel of a lady’s slipper, this popular kabab is super easy to prepare with the STOVE TOP Stuffing Mix. Process first 6 ingredients in food processor until finely chopped; transfer to large bowl. Add remaining ingredients; mix well. Shape into 10 (2-inch) patties. Heat large skillet sprayed with cooking spray on medium heat. Add 5 patties; cook 5 to 6 min. on each side or until done (160ºF). Repeat with remaining patties. Serve with Creamy Coriander Chutney for dipping. Cut tomato in half, then squeeze each half to remove the seeds. Help your friends and family eat right with this delicious kabab that's prepared with better-for-you ingredients.